I’m fortunate to know a growing number of bright, enthusiastic and talented artists. Irrespective of their discipline, they characteristically show modesty, a genuine warm personality and possess a natural ability to make an impression on our world. One of these is Laurence Tonderai Shango Muzah , a very gifted painter from south London. I took a few minutes of his time to ask a few questions on his career to date. What inspires you and how do you keep motivated? 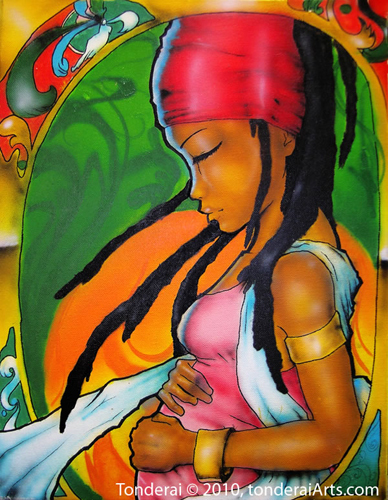 Love, ancient African culture, spirituality, nature and many things really. I feel like I have a lot of ideas I need to express and share. Knowing I have a lot to say keeps me motivated. Paintbrush. 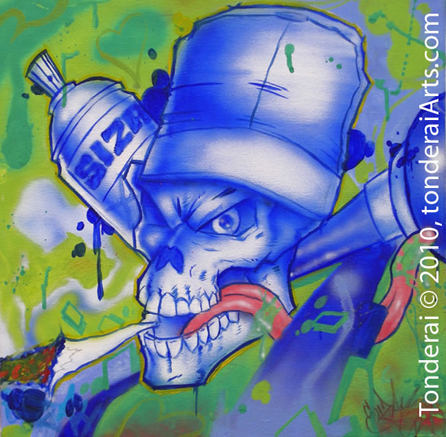 I like using airbrush and spray cans, but you don’t have the same ‘hands on’ feel as you do with a brush. The brush is very relaxing, it’s like doing Thai Chi. Your work is very figurative, colourful, sexual and thought provoking; is there a conscious message you try relaying in your work? Yeah, I’m always trying to get people to think, discuss, debate and look at life from another perspective. Sometimes it’s not conscious. I may have a vague idea but I’ll go with the flow. I think art should be food for the mind and soul, not just the eye. The arts world is likely to struggle over the coming years. How have you handled the commercial and business side of being an artist during this financial climate? I’m really just starting out as an artist trying to make a living of my craft. I have been relying on my graphic design skills, doing flyers, logos, customising t-shirts. It’s a competitive field; you have to constantly push your skills. Where do you see the future of art in the UK particularly for emerging artists such as yourself? I’m not sure. It’s going to get harder as there have been cuts with art workshops I was doing. Art will always be around but its important art workshops for young people aren’t completely shut down because of the less funding. What are the best and worst parts of being a full time, working artist? Making a living of creating and being able to express yourself. Our ability to create is one of our greatest gifts so it’s very fulfilling hearing people’s feedback on how they interpret your work or how it makes them feel. The other side would be not having a regular income (yet) or not having the security of a 9 to 5..
Just starting out myself but I have learnt planning and time management so far. The painting is only one side as you have to understand the business element too. And finally, where do you see yourself in ten years? Producing bigger and better works, bringing through the next generations of artists and bridging the gap with musicians, artist and poets. Inheritance Tax- Art Funding via the Government’s Big Society? George Orsborne, Chancellor of the Exchequer. 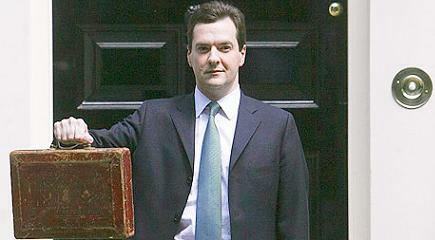 Most of the UK population will be examining this week’s budget over the next few days. Some of us will just conclude we are worse off. Others will try, at least for a few minutes, to make sense of how Osborne’s calculations and tax savings add up to financial rewards or major losses. The chancellor announced £540m worth of tax breaks for charities in his budget, including inheritance tax reforms designed to encourage UK citizens to leave a charitable legacy when they die. Is this just an immediate attempt to revive the UK government’s faltering “Big Society” scheme ? Is it offering an alternative funding stream after charities are left penniless and local council grants are cut? I believe charity bosses and leaders from the arts world must welcome any drive for philanthropy if it helps. Aside, this may be the answer to culture Secretary Jeremy Hunt’s ambition of making philanthropic giving a more important strand of funding for the UK arts world. The arts world has been pushing for tax reforms. For example, Sir Nicholas Serota, Director of the Tate, welcomed the reforms saying such moves will make a real contribution to creating a culture of giving. This may be true but the act of giving remains deep in the shadow of public sector cuts to funding and a lost opportunity for creative professionals to work, contributing to the culture and economic growth of the UK during tough times. I hope organisations across the country will take advantage of these new provisions but we need to see evidence of it working very well before we start praising Mr. Osborne. Let’s watch this space and see what happens! I’ve been spending time in New York and Washington being inspired by artists, poets and musicians. I feel enriched and fortunate to speak with such creative people. Ironically, I recently received the following article on DC based artist GA Gardner. The article inspires me to experiment further with mediums and themes whilst paying more attention to my own environment. Award-winning writer, editor, and journalism professor Olive Vassell published a review on Trinidadian born Gardner. The following excerpts feature on the ‘Repeated Islands’ blog. The full article is available to read from http://www.cawmagazine.com. In a recent Trinidad exhibition of his collages called “Pieces of a Puzzle,” Gardner showed his mastery in melding them all. His collages are striking – their dynamic, multi-layered construction speak to levels of complexity that encourage the viewer to look deeply and carefully at what is really being represented. Meanwhile, the bright primal, textured backgrounds infuse each piece with vitality. 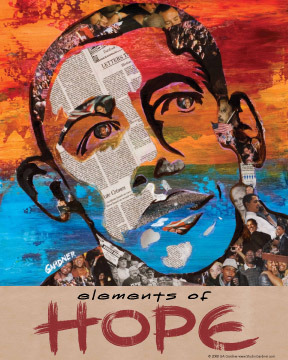 Gardner’s collage work began in earnest in 2008 when he was asked to create a piece to mark U.S. President Barack Obama’s historic election, called “Elements of Hope.” The work was seen on CNN’s Larry King Live, in the New York Times and in numerous international publications. . . . The work was so warmly received that Gardner created posters from it. The artist has since donated some of the proceeds from the sales to a variety of charities. And in 2010, he specifically created a piece titled, “Haiti: Hope for the Children,” to raise funds for the country after the devastating earthquake there.
. . . Throughout the journey, Gardner continued to make art, experimenting with different forms, such as computer generated work, film, animation, and low relief wood sculptures. When he returned to his studio full-time in 2007, it was with a burning desire to consolidate what he had learned in the years since he had been away from Trinidad. Using the foundational lessons of his birthplace, Gardner’s initial direction produced a series called The Elements. A rich range of abstract work with themes such as sky, water and earth, the pieces are a keen observation of nature, its forms, and its colors. The artist is still experimenting with the series which so far have produced variations, including “Sky and Water,” “Sand and Water,” and “Green Earth.” “My work represents my connection with the rich natural environments found in Trinidad. However it is an expressionist approach. [. . .] In essence, my work is not abstract; rather it is a representation of abstract subjects in our environment. For further information please visit.